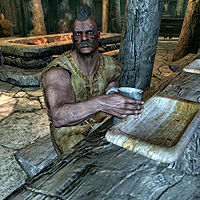 Alding is a Nord warrior. Along with Gjuk and Irlof, he forms the crew of Blood Horker Captain Stig Salt-Plank. He and the rest of the crew only exist during Rise in the East, after you give the logbook to Orthus Endario, where they are found in the Windpeak Inn, partaking in their regular "festivities". After the initial scene plays out, he will be found sitting in place at a bench inside of the inn, enjoying a tankard of mead or eating bread. He only wears a roughspun tunic with some footwraps. While Stig mentions he and his crew will be retreating to Hammerfell, they actually remain in the Windpeak Inn for the rest of the game. This page was last modified on 29 December 2017, at 02:38.